Lt. Cmdr. Kouhei Hanami had ordered top speed for the run back to Rabaul that night, August 2-3, 1943. Amagiri, one of the finest class of destroyers in the world, had been reduced to escorting troop convoys to the beleagured Japanese garrison on Kolombangara. Last month, on a similar run, she had run into some American cruisers and destroyers, and lost ten of her crew. No doubt, her officers and men wanted to make full speed that night. They had just started the 400 mile run for Rabaul, in the darkness of Blackett Strait, when Amagiri’s lookout spotted something small dead ahead. Most likely an American PT boat. Amagiri’s helmsman sped right for it and rammed the small boat, smashing it to bits. Most of the crew of PT-109 survived, including her skipper, Lt. John F. Kennedy. Kennedy swam to shore, got out a message for rescue (carved on a coconut), and survived, later writing a book about his naval career and rising to be President of the United States. Amagiri is surely the only ship to have ever sank a vessel skippered by a future American President. 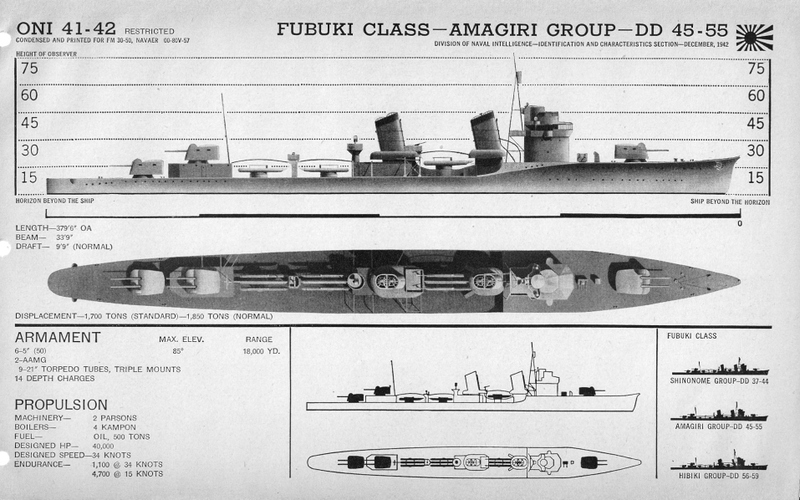 The Amagiri (天霧 “Misty Rain”) was one of 20 Fubuki class destroyers of the Imperial Japanese Navy, built at Tokyo, Japan. Commissioned in November 1930, she spent the 1930s taking part in combat exercises and in the Sino-Japanese War. From the beginning of the Pacific War, Amagiri was constantly in service. From December, 1941 through March, 1942, she took part in the invasions of Malaya, Sumatra, and the Andaman Islands. While raiding with cruiser Mogami and Mikuma in the Indian Ocean, she assisted in the sinking of three merchant ships. During the Midway operation, Amagiri was assigned to the Northern (Aleutians) force. Beginning in late August, 1942, Amagiri was drawn into the long struggle for Guadalcanal and the Solomons. In three months, the destroyer made a dozen forays down The Slot. From the main Japanese base at Rabaul to Henderson Field is 560 nautical miles, more than a full day’s travel each way, assuming a cruising speed of 20 knots. On at least three of those missions, she was involved in rescuing stricken ships or pulling survivors out of the water. By December 1942, the Japanese were forced back up the Solomons chain, and Amagiri ran 17 supply missions to the seaplane base at Rekata Bay on Santa Isabel Island in the first half of 1943. 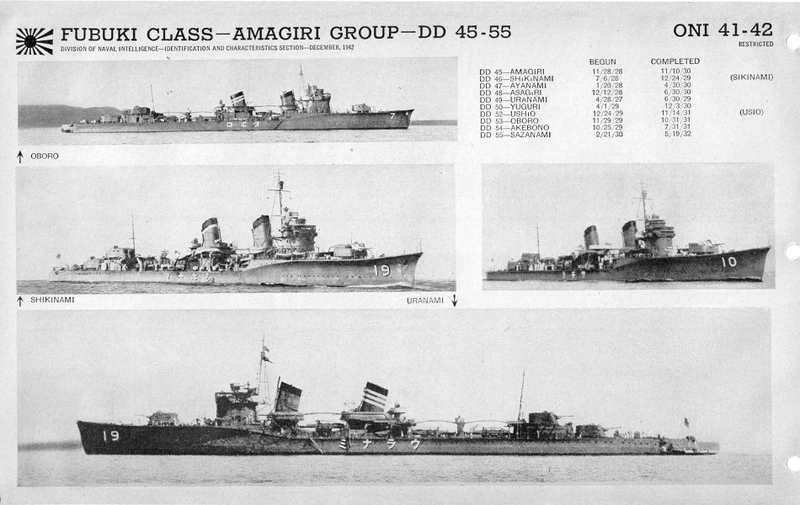 On 5-6 July, 1943, Amagiri was engaged in the Battle of Kula Gulf. While on a troop transport run to Kolombangara, she engaged a U.S. cruiser-destroyer group. She was damaged by five shell hits, communications knocked out and 10 dead. After the battle, she attempted to rescue NIIZUKI survivors but was driven off by USS NICHOLAS (DD-449) and USS RADFORD (DD-446). In August, Amagiri had her famous encounter with future President John F. Kennedy’s PT-109 in Blackett Strait. But her war was not yet over. Throughout the rest of the year 1943, Amagiri toiled on in the Solomons: transport runs to Tuluvu, Buka, Kavieng, Bougainville; troop evacuations from Kolombangara, later evacuations from Buka. In December, she was repaired at Truk, and in early 1944, overhauled at the naval yard in Kure, “X” turret being replaced by two triple 25mm mounts during this refit. In March, 1944, Amagiri was assigned to the Southwest Area Fleet, operating out of Singapore. On April 20, she departed Singapore, escorting Aoba and Oi. She struck a mine in Makassar Strait, 55 miles south of Balikpapan; took two hours to sink while Aoba removed her crew.